Here’s our go-to party pleaser that adds a traditional Mexican twist on the original. You may need to go to a Hispanic market to find tour secret ingredient for lining the rim of the glass. It’s called Tajin (Tah-heen), a staple seasoning from Jalisco, and it’s a combo of Dehydrated Lime Juice / Chile Pepper / Salt. You definitely want to get a hold of this for your pantry! Cut the 4 limes in half. Use a 5th lime to cut 4 slices for garnish. Fill a large cocktail shaker with ice. Add tequila, agave nectar, and fresh water, in that order. Use a lime squeezer and add the juice of the 4 limes into the cocktail shaker. Shake shake shake! Use a wedge of the remaining lime and press around the rim of each glass. Pour the Tajin seasoning onto a plate or paper towel. 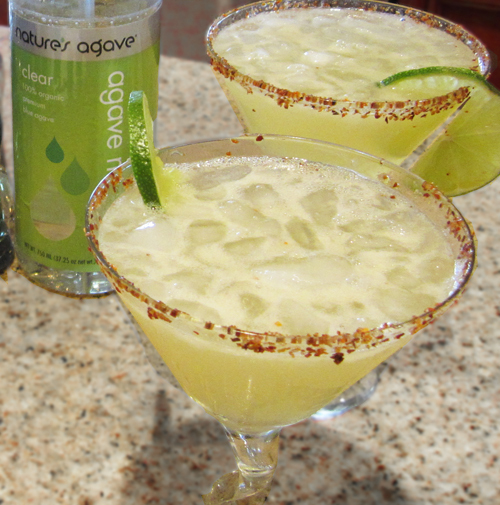 Roll the rim of the glasses around in the seasoning so the Tajin creates a solid red edge at the top of each glass. Add ice to each glass, then strain the cocktail into each glass. Add the lime garnish and enjoy!